There are some people who are just amazing bakers and cake decorators, and there are others who are not. Unfortunately, I'm in the latter group. As much as I'd love to bake a cake from scratch and decorate it with beautiful fondant designs and piped icing, it's just not going to happen. However, that doesn't mean I don't want to try to make an effort to give my kids a special "homemade" birthday treat. My daughter's birthdays are just a few weeks apart and we usually have a joint party for them with family and a few friends. I'd seen several examples around blogland where crafty folks made their own beautiful cupcake stands with thrift store plates and cups and knew that's what I wanted to do for my girls. They could each have their own stand and I wouldn't have to bake anything fancier than cupcakes. 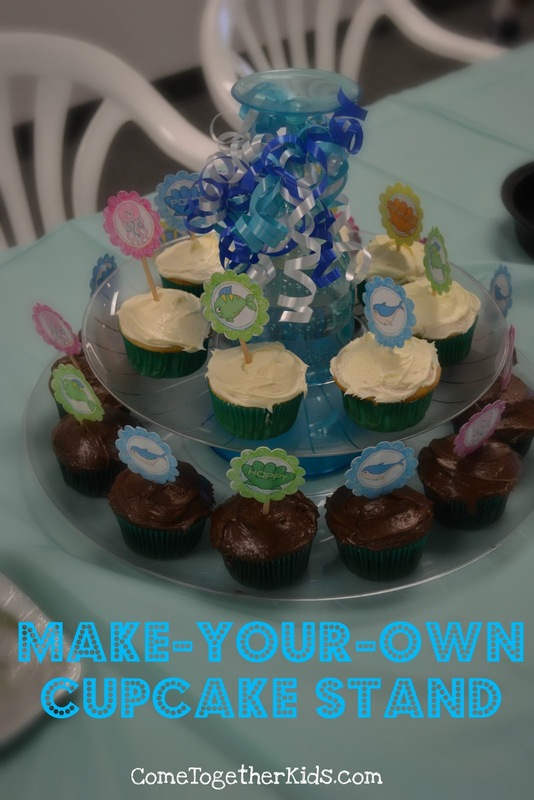 I was so pleased with how they turned out, everyone loved them, they each cost less than $10 to make AND I can take them apart to make a different version for our next party! I was hoping to find the plastic trays at the dollar store, but they didn't have the graduated sizes I needed. I ended up "splurging" at the party store and bought the large tray for $4 and the smaller one for $3. 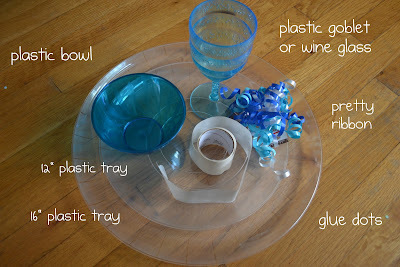 I also picked up the plastic bowl and wine glass in the colors I needed for less than $1 each. Because I opted to go with all lightweight plastics, I was able to attach all the pieces just using glue dots. They held up just fine for the party and I could easily pull them apart afterwards! 1. Using glue dots on the rim and bottom of the bowl, attach the two trays together. (I thought it seemed sturdiest to have the bowl upside down) Then turn the goblet upside down, put glue dots on the rim and attach to the center of the top tray. 2. Add some ribbon to the stem of the wine glass for a little pizzazz! 3. Fill with cupcakes. 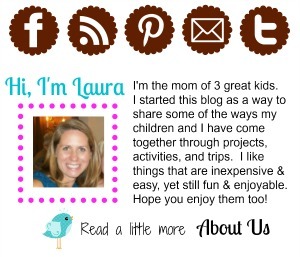 I used the adorable free printables I found HERE at Tip Junkie. So cute that you barely notice the cupcakes from a box mix and canned frosting! 4. 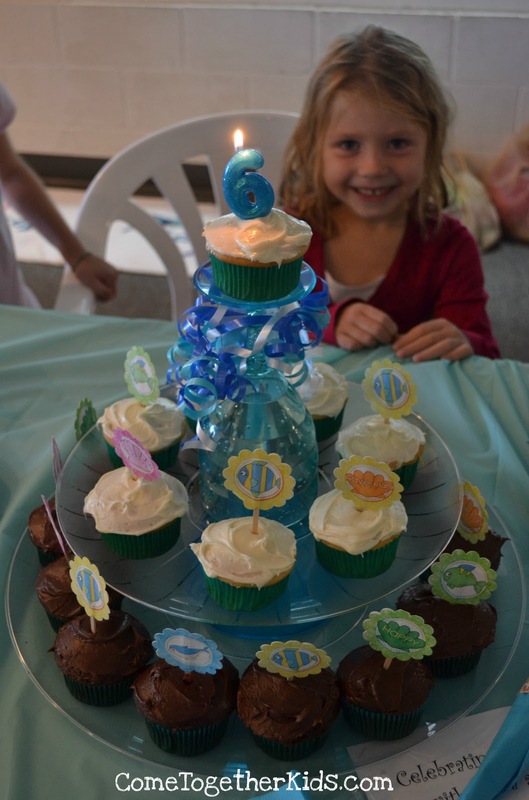 Add a special cupcake with a candle to the top and present to your birthday girl! How cute is that? (and cheap and easy too!) Without a doubt, I'll be doing this for future parties as well. 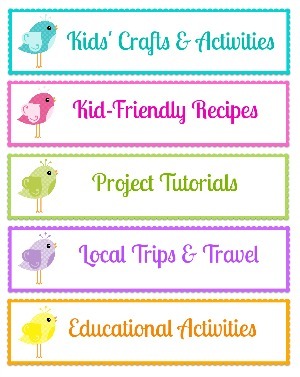 wow, very cute -- and easy to do! thanks for sharing!!! i will definitely be doing this very soon! What a very cute idea! Thanks for sharing....yours came out great!! Looks really nice! Thanks for sharing! Your Cupcake Stand is great. Very creative. I love your creativity! I never would have thought of using those items. that's one i haven't seen yet! way to be creative!!! Fabulous idea. I needed this for a party I did recently and I didn't want to buy one. Thanks I am using this in the future! Thank you for the recipe! I really enjoyed of cooking this when my rice cooker was cooking rice. It is able to calculate the time that will be required for the rice to be properly done. Visit the following website page to know more about this. The rice cooker is the best helper on the kitchen of busy woman. OMG – this is adorable! I’m going out to get the supplies pronto to make this! LOVE it! On Demand Regeneration Regeneration is done as needed. WaterGadget water container, and so on. Well, save your life by obtaining Morton system. and install is an application that enables the users to have a complete Lucky Patcher APK Download The primary goal of the app is to manipulate the apps. Protected login as well as right of entry to the employees portico litebluelogin also qualified ones are both based on the retired life programs. You show signs readily available there for your pupils that might need that sign and support. DadeSchools If your trainee is an FG reader, you can relocate up and also set your reading top priority.